How to be a Sunday-Only Real Estate Investor. Jack and Jill teach you! Jack Butala: How to be a Sunday-Only Real Estate Investor. Every Single month we give away a property for free. It’s super simple to qualify. Two simple steps. Leave us your feedback for this podcast on iTunes and number two, get the free ebook at landacademy.com, you don’t even have to read it. Thanks for listening. Jack Butula: Jack Butala with Jill DeWit. Jack Butula: Welcome to our show today. 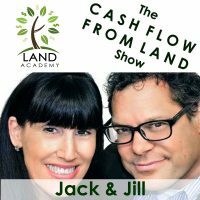 In this episode Jill and I talk about how to be a Sunday Only Real Estate Investor. That’s what I was for years. Years and Years. Before we get into it, let’s take a question, posted by one of our members on successplan.com, our free online community. All right. Luke, I am not sure which Luke this is, we have several. They know who they are. Jack Butula: All Luke’s are doing great by the way. Jill DeWit: Isn’t that interesting. Jill DeWit: That’s what I’m saying. I’m not sure which Luke it is. But when I see that name I know it is going to be a good question. Jack Butula: Luck is on your side man. Jill DeWit: Exactly. That’s right. If your name is Luke, join our world. You’ll be just fine too. Because our two other Luke’s will help. All right Luke asks “I have a buyer that wants to determine, if a septic system can be put in, prior to purchasing the property. Do you recommend getting it under contract and letting them do a test, while it’s under contract. Or just tell them that they can have a test done now without getting it under contract, or, handling it some other way”. Jack Butula: There is two questions here. A Perc Test is what Luke’s talking about which is testing the soil for solubility. How soluble the land is. If the land can handle a septic system. That’s what they are talking about. Yes, I would say yes. Go ahead and do the Perc Test, do whatever you need to do. Not put a septic system in, but test to see if it will take it. That’s a regular part of due diligence. That’s sort of like doing a “walk through” on a house before you buy it. That’s really what that is. Jill DeWit: The guys going to pay for it themselves obviously, because I am not going to pay for it, but if they want to pay for they’re own Perc Test and come out and do it. Great. I just got free information on my property is really what it is. Go ahead and build a house while you’re there too. Then he can decide. Jack Butula: Make sure it’s one that you can’t take with you. Jill DeWit: Exactly. Go lay that foundation. Thank you. Jack Butula: So yes, I would absolutely within reason, let people do what they need to do to see if they want to buy it. But not for four years, maybe a week. Jill DeWit: You know what, I just thought about the same thing. Your not going to tie up my property unnecessarily for a month, because if somebody else comes along and wants to pay cash for it tomorrow, when your still doing your Perc thing, I love hearing what you said Jack, we may get one week or two weeks to get this done and we will sit tight, but after that, I’ve got to move on. 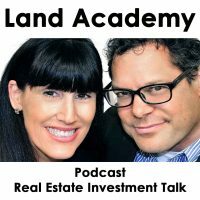 Jack Butula: If you have a question, or you want to be on the show, reach out to either one of us on Land Academies online community. Today’s topic, the meat of the show, how to be a Sunday Only Real Estate Investor. Jill, I bet you have a lot to say about this. Jill DeWit: Oh boy, do I have a lot to say about this. You know it comes down to “what do you want to spend your time on”. Time is money and if you have a full time job and a family, do you really want to be spending weeks and weeks and weeks and weeks, and trust me I talk to these people all the time, they are trying to save, and you know what in the end they don’t save any money. How much time are you spending doing it that way. You don’t have to do it that way. What’s interesting is a lot of people, I give them credit, because they didn’t know there was another way. But if you knowingly go into this trying to save, you may save $1 but most of the time you are going to be spending more money. When you can do all of this on a Sunday afternoon. Jack Butula: Yes. You probably don’t have a choice, like I didn’t. I think Jill didn’t either. You had to do this on Sunday right? You have a job, you have to pay the bills. So what you want to do, there is two basic parts to this REI career that you are embarking on you’ve already started. There is back office garbage, paper pushing and file storage and on and on and on. Then there is the real deal which is what’s going to make this work or not. This is your negotiation skills, choosing the right property, choosing the right data, choosing the right source of data. That stuff is important. You want to focus on that. You want to leave the back office garbage to people like us. We’ve already gone through it. What I am saying, is find yourself a group, doesn’t have to be ours. But find yourself a group of like minded people who have solved all these problems already so that you can actually spend four hours on Sunday and turn a deal. Make 10 grand a week. We have multiple members who are just doing two to four deals a month, maybe one, and making five or ten thousand bucks on a land flip and leaving all the garbage to someone else, namely us. Jill DeWit: Right. What you have just said is so true. We have made all the mistakes. We have tested all the stuff. We can really help you jump ahead and start making some money. How do I know this is true? Oh my goodness. Look on our online community because there is hundreds of people that are doing it. Jack Butula: Yes. Get a group. Find a group. Jill DeWit: That’s the thing. It’s crazy to try to set out on this and learn from scratch by yourself. I don’t understand why you would do that. You know what I am trying to say. Jill DeWit: What did you say? Jack Butula: Your either better together or your not. Jill DeWit: Right. I just look at when I first tried this topic, I was just thinking about just the data piece alone. I love Jack that you are talking about the whole big picture. Which is right. All of the back end office stuff, there is more than just data. Just the data piece alone is where you want it. Jack Butula: Yes. What Jill’s talking about is quite simply this. You got exactly two sources, two places you can get data, to send out offers to people who own houses, or apartment buildings, or in our case, land. The first option is the Accounting Assessor. It’s a disaster. The data is incomplete. Every county is different so you really have to have a PHD in data scrubbing. Trust me, I did it that way for a while and it’s very difficult. Or you can get it through a service like we have. Or you can go directly to Real Quest or Title Pro 24 7. Those are the two sources of data that we use and I would highly recommend the former. Because every county is in the same format, you have the assessed value in the same column every single time, So you learn it once. Not 80 or 800 times. One for every county they email. Jill DeWit: Well you know your really learning, your just pulling up the data and sending out a mailer. Now you are focusing on the transaction. That is what is so interesting. So many people are focusing on just the data, figuring out how to understand the data and manipulate the data. They don’t even get the time to think about making the offers and making good offers and not wasting money on postage sending them to the wrong people. There just getting a list and that’s the wrong way. Jack Butula: Yes. You do not want to do that. I wanted to bring that up. Lists can be twenty years old. You don’t know. I was reading in a Facebook group just yesterday about people “oh I got a hold of a list”. I’m like, that is a waste. You are going to spend so much more money on postage. Jack Butula: Yes, you can get a list for free. Jill DeWit: I’ll give you a list. Jack Butula: You can get a list for free if you search hard enough on the internet. Jack Butula: Then you are going to spend what, a thousand bucks on mailing or whatever, $5 to $800 dollars on bad data. Jill DeWit: Then wonder why you didn’t get any transactions out of it. Jack Butula: What a waste. Be real careful with lists. You want to pull data from an active data base, always, no matter what you are buying. Jill DeWit: Right. Well the big picture here is I think, to be a Sunday Only Real Estate Investor, you have to be on it and maximum your time, use your resources wisely and you can do this. That’s I think what Jack’s whole point is here. If you have the right education, the right knowledge, the right group, the right community and tools, you really can sit down and say “Alright today I am going to look at some areas, I’m going to pick out one that meets my criteria, I am going to download a bunch of stuff like ownership records and get it together and get it to the printer for Monday”. You can do that. Jill DeWit: Then the next Sunday, guess what? Now you are reviewing the things that came back. Your returning phone calls and lining up those ducks in a row. The next Sunday you could be doing due diligence and picking up the properties. Then on the next Sunday, now you own them. You could do it just like that. Jack Butula: Yes. That’s exactly right. That’s actually a pretty reasonable time frame. Jack Butula: But you need some back up as help, you need someone to process the deeds. Or you need tools online to process the deeds, to do the research, you want to have all that stuff lined up. If you spend a couple of Sundays lining that stuff up correctly and doing some research, you probably already have done research if your listening to this, line up the stuff and get professional people to do all the lifting for you so you can do the deal making. That’s really what it comes down to. Jill DeWit: Exactly. Your right. Jack Butula: And the data analyse. Jack Butula: Join us in another episode where Jack and Jill discuss how to use information. That’s me. Jack Butula: To get just about anything you want. Jill DeWit: We use it every day to find property for half of what it’s worth and sell it immediately. Jack Butula: You are not alone in your real estate ambition. Jill you have the coolest shoes on today that I have ever seen? Jack Butula: I’m going to describe them. They are black leather clogs with little spikes in them, so it’s a little bit punk rock but it’s still feminine. Jack Butula: So it’s Debbie Harry arse kicker. Debbie Harry keeps coming up recently by the way. Jack Butula: I know. I know. Jill DeWit: So love it. Thank you Jack. Do you think we explained that for everybody enough. Jack Butula: Yes I mean we could really get into a tonne of details and make a list. I was going to do that for this episode. I could reel off the 19 things you really need to be a Sunday investor. You need someone to answer your phone, someone to open your mail and scan it in for you. You need all your stuff organised in one place. That is really pre-tested by someone like us that has been doing this for 15 years now. Yes, you really need to have your ducks in a row. You need to concentrate. I read something a while ago, it stuck with me obviously. I’ll remember it forever. It was in Fast Company, that magazine. The writer said “the reason companies fail is because the people who are at the top of the company are working on the wrong stuff everyday. You know, their working on changing the tablecloths and they should be working on big picture stuff, like raising capital. I see this with some new REI investors. They’re just working on the wrong stuff, they are too detail oriented, they are not leaving the silly stuff to somebody else. Jill DeWit: I’m guilty of that. Jill DeWit: That’s a good point Jack. You have to learn that. I made a lot of mistakes. I think that I am an expert and then you politely say “No, No, Jill. You should not be working on that. You should be working on this”. Sometimes it take an unrelated third party, or just another person to be able to point out what your strength and weaknesses are. Jack Butula: Yes exactly. You know that’s a good point. Choose a good partner. Maybe it’s your wife. Jack Butula: Maybe it’s not. But choose a good partner. Jill DeWit: Do you want to be married in a year from now? Choose your wife or don’t choose your wife, depending on how you want the outcome to go. “Hey Babe, I think we should do this together”. Jack Butula: Yes maybe you want to keep the whole thing from your wife. We shouldn’t pick on the wife, we should say husband sometimes too. Jack Butula: Information and Inspiration to buy under-valued property.